Two years ago, the Environmental Protection Agency issued a proposal that would have stopped farmers from using chlorpyrifos. The final decision, however, fell to the Trump administration, and EPA Administrator Scott Pruitt decided to keep the chemical on the market while the agency continues to study its risks. This new report, however, examines another danger entirely — the risk that chlorpyrifos and two other pesticides, diazinon and malathion, are washing into streams and rivers and harming wildlife. The National Marine Fisheries Service concluded that continued use of the chemicals is likely to jeopardize the survival of endangered species of salmon, as well as orcas that eat the salmon. 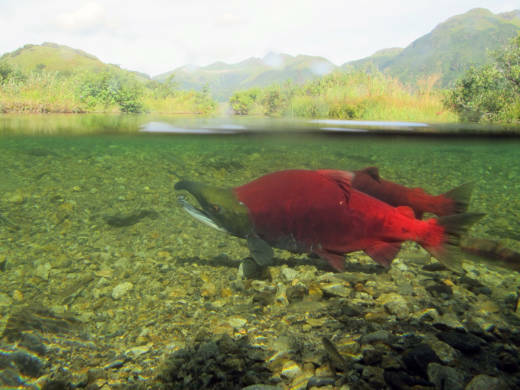 According to the report, use of chlorpyrifos is affecting 38 species of endangered salmon, and it's having negative effects on 37 areas that have been designated as "critical habitat" for endangered species. The report, called a "biological opinion," proposes an array of "reasonable and prudent" actions, short of taking the chemical off the market completely, that could reduce the risk that chlorpyrifos will get into streams and harm fish. They include prohibiting of spraying near streams, limiting aerial spraying, or requiring wide strips of permanent vegetation alongside streams. It will be up to the EPA, however, to put those restrictions in place. Sharon Selvaggio, from the Northwest Center for Alternatives to Pesticides, says that "we certainly hope that the EPA will implement the restrictions." Yet the EPA often has not done so in the past. The agency's track record in implementing biological opinions from the NMFS, Selvaggio says, is "pretty bad." Selvaggio's organization is one of several environmental groups that filed a lawsuit, years ago, that eventually forced the National Marine Fisheries Service to carry out this study. Dow Agrosciences, which sells chlorpyrifos, tried unsuccessfully last year to prevent the NMFS from issuing this opinion. A lawyer representing the company wrote a letter to Secretary of Commerce Wilbur Ross, asking Ross to shut down the NMFS study of chlorpyrifos. (The NMFS is part of the Commerce Department.) Dow Agrosciences argued that the NMFS was carrying out its work in a "fundamentally flawed" way. A spokesperson for Dow Agrosciences declined to comment on the NMFS opinion, referring questions to CropLife America, which represents the pesticide industry. A representative of CropLife America said that the organization is preparing its response.